Wat is dit voor site? Wij zoeken de goedkoopste boeken op internet. Dilbert 2015 Day-to-Day Box (P)vonden we het goedkoopst op Bol.com voor €0. We hebben gezocht in nieuwe en tweedehands boeken. Rechtsonderaan de pagina kan je het boek direct bestellen	via Bol	.com. If you work in anything that resembles an office, chances are you have coworkers who resemble Dilbert's. Maybe your boss doesn't have pointy hair, but he (or she) probably more than once has used meaningless business speak to cover a lack of knowledge--and fooled exactly no one. A guy in the next cubicle probably shows up each day just for the free coffee, and another probably works like a crazy-woman hoping for a little recognition. Dilbert creator Scott Adams includes them all. Any resemblance to your actual coworkers is intentional (and hilarious). 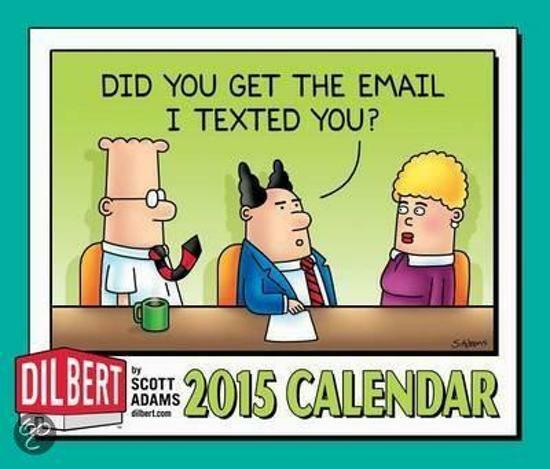 Get a head start on each day's office craziness with this best-selling Dilbert calendar that features a full-color cartoon on every page.